This blog is the 6th of the 10-part blog series introducing you to the 10 new features currently available for your use this school year. Entry and Exit tickets are a formative assessment tool that give you a way to assess how well students understand the standards/concepts they are learning in class. We’ve pre-loaded and made these available for you to use as often as necessary. The insights from these quick assessments can tell you instantly whether students have a superficial or in-depth understanding of the standards. Use the data to tailor instruction to meet students’ needs right away. 1. Where can I find the entry and exit ticket assessments? Entry-Exit Tickets can be found very easily by launching your classroom, navigating to Features and then under Math or ELA, Assessments. Choose Entry and Exit Tickets, and select the Standards and Grade Level. The pre-built assessments that correlate to the Grade Level and Standards chosen will be listed. Click Assign for the assessments you would like to assign. The short video below shows you how. 2. Can pre-built assessments be combined? Pre-built assessments cannot be combined, but you can use the Auto-Generate option to build a custom assessment which covers multiple standards. 3. How can I view results from these assessments? Launch your classroom and your assessment results are a couple clicks away. Listed below are reports which will be very beneficial for you to review. In addition, join us for a Comprehensive review of Insights & Reports in a FREE Webinar every other week by clicking here. How to: Navigate to Features and then under Math or ELA, Assessments and Assessment Results. Locate the specific assessment and click the eye for review. Application: The summary acts as a temperature gauge of student knowledge across the board. Click on the question tab to review each question and understand classroom challenges and strengths. Use this info to make pivots to instruction. How to: Navigate to Reports and then Assessment Growth Report. Filter by Subject. Then choose 2 assessments to compare. 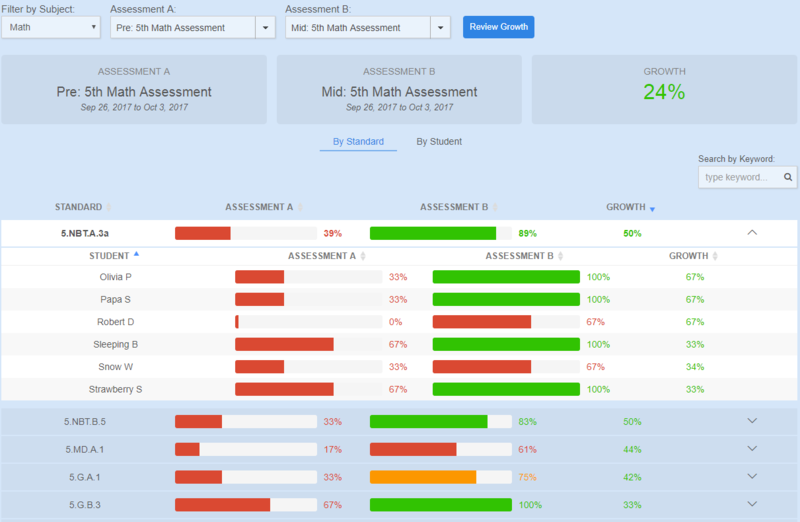 Application: This report compares 2 assessments at the standard level and allows you to drill down by student so that you can measure growth. You can also toggle and view the report by student, showing growth across standards. Determine if your students need additional re-teaching and targeted practice based on the results. To view an individual student’s report for growth, make sure to check out the Assessment Report. How to: Navigate to Reports and then Assessment Grid. Filter by Subject. Application: This report contains the latest assessment score for each student in a 2-dimensional grid format. When you hover over a cell, you can see past assessments and scores for that standard. Use this to record the latest assessment score for all students in your grade book. Also, at a high level this grid allows you to pinpoint classroom deficiencies. How to: Navigate to Reports and then The Standards Report. Application: This report contains Mastery (Practice) and Assessment data side-by-side. Drill down by student to compare and contrast performance for each standard. Use this to determine if your students need additional re-teaching and targeted practice in a specific standard. Learn more about “Entry and Exit Tickets for Quick Formative Data” and see this in depth by joining a Free Formative Assessments Webinar available every other week throughout the school year.